Owing to the fact that I have decided to honor Steven Spielberg this year with my version of a Lifetime Achievement Award I figured it was an appropriate time to dust off some old reviews I wrote when I took a course on his work. The remarks still hold true, he is an amazing filmmaker. Here is concrete proof that comedy is unquestionably the hardest genre to succeed in. Without trying to get inside Spielberg’s head and trying to determine exactly what it was that he was trying to do with this film, one can look at it as is and be left scratching their head. It is at best funny in small patches and most definitely a humongous waste of talent both on and off camera. I applaud Spielberg for not only making a huge departure from his big successes (Close Encounters and Jaws) but also for poking fun at the latter in the opening sequence of the latter film. This stands out as one of the few truly comic sequences throughout a film that is plagued by many difficulties. This film especially pales in retrospect considering that I’ve laughed much more during his action/adventure and sci-fi films and this film doesn’t seem to make any sincere satirical jabs at the paranoia in the United States following the bombing of Pearl Harbor, nor does it really succeed at being a farce. In its better moments, which were few and far between, 1941 is hysterical. More often than not, however, 1941 is poorly executed slapstick, ham-handed, off-the-wall nonsense that follows the wrong characters and actors. So that this isn’t a complete diatribe there are some wonderful performances to be found here but as I’ve mentioned above these people make their exit from the film much too early. Probably the best performance in this all-star cast is that of Slim Pickens. He delivers not only some of the best lines of the film but delivers them only as he could with that imitable voice of his. Elisha Cook is also there but that’s about all what strikes me as really being odd is how ill-utilized these actors were. Most of the cast was a mish-mash of SCTV and Saturday Night Live stars who really didn’t do anything noteworthy. Dan Aykroyd got to do some of his shtick but his performance was undermined by some stupid writing, when towards the end for no reason known to man he went bonkers and exclaimed, “I’m a bug,” while he had wrapped oranges over his eyes with pantyhose. It got worse though John Candy, one of the funniest people who ever lived was just there for seemingly no reason, it was as if the casting director went amuck knowing that Spielberg could get any actors he wanted and got big names to do meaningless roles. Another under used player was Joseph P. Flaherty who provided the film with one of its best lines following the USO riot (“Maybe in the future we could have some Negroes come in and we’ll have a race riot.”) was also hardly there. 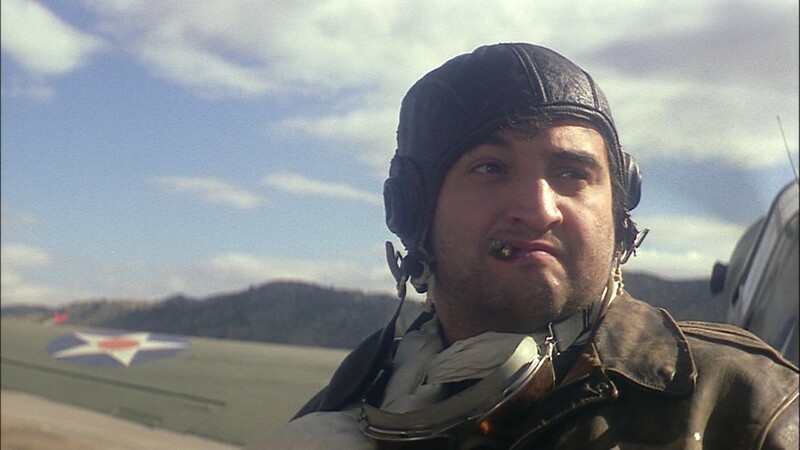 Then there was Belushi, who I’ve always found overrated, doing an annoying version of the Penguin from Batman. He was occasionally funny in this and in other roles but overall I was unimpressed. The big problem this film had was that it was more likely to lose its audience before tying all the storylines together. The additional factor of having the last 45 minutes of the film being one explosion, crash or pratfall after another didn’t help much at all. Another factor that didn’t help this film was that on home video (apparently this version is somewhat different than the theatrical release) it is 2 hours long, it’s very difficult to do a comedy that lasts more than 90 minutes long. About the only thing that made me realize that this was a Spielberg film was the inclusion of the Dumbo screening, which was both fitting to the story and helped me make it through that part of that performance because it is one of Disney’s finer works. The score was also a non-entity that I didn’t even think Spielberg worked with John Williams. The writing was also schizophrenic, spotty and unusually unfunny most of the time and I was almost shocked to find that Robert Zemeckis had a hand in writing it. It’s as if everyone was embarrassed with the end result so that there were no opening credits only closing ones.